The rumour that the solo concerto repertoire for cellists is limited has probably been sufficiently refuted in the meantime. But it was in the first half of the 18th century that the alternatives to Antonio Vivaldi’s many concertos were scant. 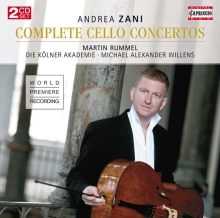 Hence the discovery of twelve ‘new’ cello concertos from this period is correspondingly exciting. The fact that the discovery of these works by Andrea Zani is the success of a musicologist who wrote her Ph.D. thesis at the University of Canterbury in Christchurch (New Zealand) is one of the positive miracles of modern communications technology. Dr. Jill Ward has presented a comprehensive complete edition of all the currently known works by Andrea Zani and written an impressive biography. Only few detailes are known about the life of Andrea Zani. Born in Casalmaggiore on 9 September 1696 his way took him from Mantua, Milano to Vienna where Antonio Caldara was vice maestro da cappella at the imperial court. Zani’s death through the over-turning of a coach on a journey to Mantua in September 1757 cut short the career of a musician still in his prime, highly regarded by his contemporaries, and a not insignificant figure as instrumental music moved into the pre-classical era.